Your choice of options contains items that are not in stock. * Prices do not include taxes, freight, installation charges, duties, and customs fees if applicable. If your dealer is out of stock, we can supply them within approximately five business days. This wood fireplace offers peace of mind due to the combination of energy efficiency and clean heating. A simple solution; its clean design suits any type of decor. Large fireplace. Behind its large glass door, the 4.28 cubic foot combustion chamber can hold an impressive 60 lbs of wood. Low emissions. 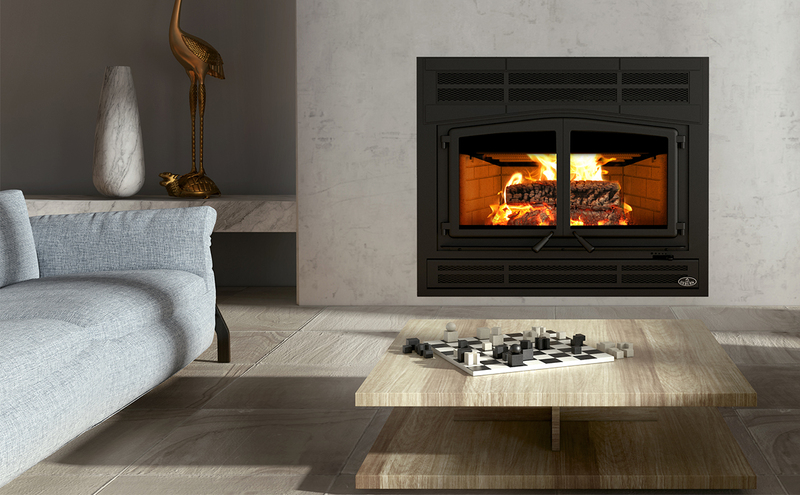 This energy efficient fireplace complies with the EPA’s clean-air standards (only 1.6 g/hr of emissions). High efficiency. The Horizon fireplace is capable of heating large spaces and burns for 10 hours. Government incentives may apply to this product. *Note that the price displayed on the web includes the prairie style faceplate and the moulded refractory brick panels that are required components for this unit. GLASS HEARTH PAD 10 mm - 18" X 50"
() Recommended heating area and maximum burn time may vary subject to location in home, chimney draft,heat loss factors, climate, fuel type and other variables. The recommended heated area for a given appliance is defined by the manufacturer as its capacity to maintain a minimum acceptable temperature in the designated area in case of a power failure. (2) The maximum heat output (dry cordwood) is based on a loading density varying between 15 lb/ft³ and 20 lb/ft³. Other performances are based on a fuel load prescribed by the standard. The specified loading density varies between 7 lb/ft³ and 12 lb/ft³. The moisture content is between 19% and 25%. (3) As measured per CSA B415.1-10 stack loss method. (4) Higher Heating Value of the fuel. (5) Lower Heating Value of the fuel. (6) Performances based on a fuel load prescribed by the standard at 7 lb/ft³ and with a moisture content between 19% and 25%. (7) Optimum overall efficiency at a specific burn rate (LHV). (8) This appliance is officially tested and certified by an independent agency. Approved for an alcove installation N.A. Glass surface – dimensions (Width X Height) 29 3/4" X 13 1/2"
Overall dimension (Height) 43 3/8"
Overall dimension (Width) 50 3/4"
Overall dimension (Depth) 31 3/4"
Door opening – dimension (Height) 12 3/4"
Door opening - dimension (Width) 33"
Firebox – dimension (Height) 17"
Firebox – dimension (Width) 25 3/8"
Firebox – dimension (Depth) 17 7/8"
* Specific components may be required depending on the chimney manufacturer. Clearance – top (measured from the platform on which the appliance is installed)** 84" 84"
Clearance – combustible side mantle to unit 8" 8"
Clearance – side wall 24" 24"
1- The moisture content of your wood is too high. 2- The air control mechanism is not open enough. 3- The logs that you are using are too big. 4- The chimney draft is too weak. The combustion time for an EPA or CSAB415.1-10 certified, non-catalytic wood appliance depends on many factors, the most important being the size of its firebox. Heaters with a 2.0 cubic foot firebox or more will normally have longer burn-times. From 6 to 8 hours is about the burn time you will get. Some companies will advertise longer burn times, but be careful, this calculation is made from the time you light the fire to the time there is absolutely no combustible left into the firebox. No matter what the appliance model is, the maximum BTU output will be obtained over approximately 33% of the total burn cycle. This represents 2 to 3 hours for a medium-size stove. So realistically, you will have to reload the unit every 3 or 4 hours in order to get the maximum heat out of your appliance when you are home. If you don’t reload the heater and let it burn the remaining fuel, your output will slowly decrease until there is no useful heat left to produce (we call this the “tail end” of the combustion cycle). This “tail end” will provide heat for another 4 to 5 hours. So if you are looking for a 6 to 8-hour burn time, make sure you choose an EPA or CSAB415.1-10 certified wood heater with a BTU output (using cordwood) of 60,000 BTU or more. Appliances with that kind of output all have fairly large fireboxes. If you are going to rely mostly on wood for heating and your house has more than 2,000 square feet, do not hesitate to choose one of our larger units (>85,000 BTU). Those appliances will have a burn time of approximately 8 to 10 hours. EPA or CSAB415.1-10 certified heaters function best on a 6-inch chimney (interior diameter). The problem with an 8-inch chimney is that the appliance may struggle to heat-up the air volume contained inside the chimney. A hot chimney is required to create enough draft. Poor draft will inevitably lead to poor combustion, which will cause smoke roll backs, a dirty glass, lack of heat, and a large quantity of unburned fuel inside the firebox. It is therefore highly recommended installing a 6-inch liner inside the 8-inch chimney. This liner may be rigid or flexible. How much heat transfer should I get from my fireplace using a forced air kit? There are many factors that can influence the amount of heat that can be transferred to other rooms with the installation of a forced air kit. The system length, the number of elbows and the insulation of the ducts can have a major impact. The shortest and most direct runs will minimize heat loss. These factors should be considered when planning your installation. Heat transfer will be optimized when your fireplace is hot. Transferring heat too early when the fireplace has not yet reached its optimum operating temperature can quickly cool off the firebox and cause poor combustion. A blower that is too powerful can also create the same negative effects. The ideal situation is a lower but constant air flow when the fireplace is hot. It can then be expected that at least 25% of the fireplace heat will be transferred to other rooms. It is important to note that the forced air kit sold by the manufacturer of the fireplace has been tested for safety. If you use another system, there is a serious risk of house fire. If in doubt, consult a professional installer.